Cataracts are the leading cause of vision loss in people over the age of 55. Since cataracts develop as with, the incidence continues to increase as our population lives longer. Cataract surgery is one of the most successful performed surgeries in the U.S. Each year, about 3 million cataract surgeries take place. A cataract is a clouding of the natural crystalline lens of the eye. They usually start to develop around age 60 and progressively worsen as time goes on. Everyone will develop cataracts eventually if they live long enough. Common symptoms of cataracts include: blurred vision, glare around lights, dulling of colors, and, requiring more light to read. Fortunately, cataract surgery can repair the problem. The procedure involves removing the natural cloudy lens and replacing it with a clear, synthetic intraocular lens (IOL) implant. 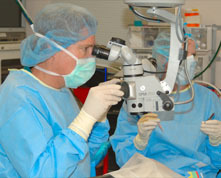 The majority of Dr. Hertzogs' cataract surgeries are performed using a technique called phacoemulsification. 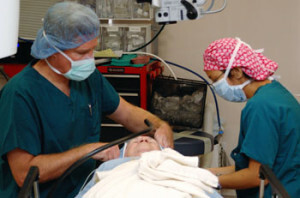 The cataract is removed through a microscopic incision using energy from the phacoemulsification machine. The intraocular lens is then inserted through this same microscopic incision. No sutures are required and the surgery is painless. What Are PREMIUM (Intraocular Lenses) IOLs? IOL implant technology is finally catching up with visual demands. There are now more options to correct vision than ever before. This results in better visual outcomes which reduce and sometimes eliminate a person’s dependency on glasses. Specifically, the AcrySof IQ ReSTOR® IOL implant is a relatively new IOL that helps people see better at distance and near, often without glasses. Alcon also makes a toric IOL implant that promotes better vision by reducing or eliminating astigmatism. Which IOL implant(s) is appropriate for a patient is determined after carefully considering many factors: pre-operative measurements of the eye, current specific visual demands, and future visual goals. Dr. Leif Hertzog, a cataract surgeon Long Beach, began his practice over 30 years ago, and has done approximately 14,000 of these surgeries. He is a recognized expert in the field. Dr. Leif Hertzog is currently specializing in the placement of PREMIUM IOLs. Dr. H. Dieter Hertzog has performed over 4,000 eye surgeries and also specializes in premium lens implantations with RESTOR and Toric IOLs. He continues to teach cataract surgeries at USC where he staffs the residents in both routine and complex cases.